New improvements may happen in the future to mitigate traffic congestion near the intersection of Tehachapi Boulevard and Steuber Road, depending on the findings of a traffic study. 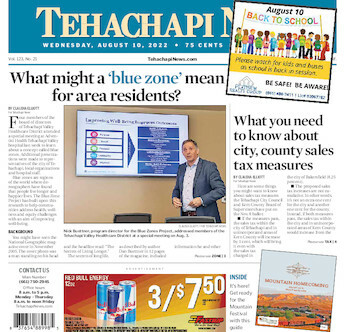 Traffic congestion at the intersection of Tehachapi Boulevard and Steuber Road may be reduced depending on the findings of a recently approved city of Tehachapi study. It will look at moving Highway 58 ramps and improving intersections to alleviate congestion in the area. City staff and Caltrans have agreed that a new study on any long-term modifications for the nearby roads and highway ramps is needed, even though traffic studies were conducted for the area before the travel centers were in construction, said Jay Schlosser, development services director for the city. The East Tehachapi Operational Improvements Study unanimously approved at the April 1 City Council meeting will look at future private and public development of the area, traffic signal operations, volume counts, addition of roundabouts, reconfiguration of the highway ramps and the impact to surrounding properties. Stantec Consulting Services, Inc., an engineering consulting company, will conduct the study using city traffic mitigation funds of more than $39,000. “We will collect a large amount of data in order to evaluate traffic conditions along Tehachapi Boulevard, from Steuber Road Road to Monolith Street, and based upon the data we will be developing a variety of potential improvements for the corridor,” said Dennis Lammers, senior transportation planner for Stantec Consulting Services, Inc.